Women make up around 11% of construction industry professionals, but with considerable debate and promotion currently on the subject this number can only be set to rise, with more and more women choosing construction related jobs. Misconceptions about gender specific roles are gradually diminishing and while the initial image is always one of a hard hat on a building site, the industry is full of diverse opportunities for woman. To highlight the case, we are spoke with some women who have risen to the top of their organisations to get their views on the industry and find out why more women should follow their example. 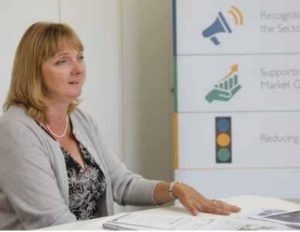 Dr Diana Montgomery, Chief Executive of the Construction Products Association explains how the construction industry is changing to improve gender and ethnic diversity. What is the role of the CPA? The CPA represents the £56 billion construction products market and our membership covers around 85% of the relevant manufacturers and distributors, so we really can speak on behalf of this huge sector. We are an umbrella organisation, so in addition to major companies, we represent all sizes through the membership of over thirty trade associations. Our role includes economic forecasting for the sector, providing analysis of the way the sector is changing, the impact of government policies and commenting on the national infrastructure plan. Our quarterly Forecasts, Construction Trade Surveys and State of Trade Surveys, are primarily used for business planning by multinationals and SMEs alike from across the construction supply chain, including contractors, consultants and manufacturers. We do a lot of work around building product standards and testing, digital impact and sustainability. Following the Grenfell Tower fire, last year the CPA was asked by government to join an Industry Response Group alongside two other construction trade associations, to provide a cross-industry response, drawing in expertise and data that would help meet the challenges arising from fire. We were subsequently heavily involved in Dame Judith Hackitt’s Independent Review of Building Regulations and Fire Safety, having chaired her working group for regulations and guidance. Additionally contributing to two other working groups looking at maintaining the ‘golden thread’ of information that ensures a building can be managed safely, and a working group on quality assurance and products. Another area of work focuses on Industrial Strategy. I am chairing for Innovate UK, a business board, which has pulled together business people and academics to help steer the investment of £170 million that Innovate UK are putting into the Construction Challenge Fund. We are also interested in future efficiencies for the industry such as; integrated supply chains, off site manufacturing, using digital technology and modern methods of manufacturing and production. What attracted you to the CPA? My background is manufacturing and sustainability, initially in academia, then across lots of different sectors including FMCG, transport, energy, chemicals and now construction. I came to CPA because it looked like an interesting area and an opportunity to really promote manufacturing. I was soon struck by the fact that Government had a relatively low awareness of the importance of construction products in the built environment, and the good things that manufacturers were doing were not being heard at this level. We still face that challenge now. We do have two manufacturers on the Construction Leadership Council but more needs to be done to get this message to Government. This job is all about bringing people together to find solutions to interesting challenges such as; making the sector more profitable, making the market more stable and sustainable in terms of carbon and energy, and how manufacturers and distributors get their voices heard better. I love getting out and visiting manufacturing sites and hearing from people who are working on the products day to day. Also, when we get to take CEO’s from our companies to meet MP’s it is always very interesting to hear the conversations they have and help raise awareness of the sector. Being invited to chair the Innovate UK advisory board is really rewarding because they have effectively recognised that products and CPA have a lot to offer. I love getting out and visiting manufacturing sites and hearing from people who are working on the products day to day. Where are the opportunities for women in construction? There is a huge opportunity and I would say, go for it. I think construction is at a real tipping point and it’s exciting. There is a large increase in the opportunities coming through, particularly for young people. The way technology is changing there is no reason why diversity is an issue still. There is absolutely no reason why out on manufacturing sites, particularly if we are looking at offsite manufacturing or digital, that you can’t have both gender and ethnic diversity. I believe that the projects would be so much richer because of that. I guess it’s quite hard for women not to try and fit in and be the same as everybody else when starting out in a job, but I think the real value in diversity is that people bring their own unique skills and that mix will make us a much richer industry. The challenge is, how can we help people to demonstrate their skills, so we don’t try to fit people into the corporate norms, but instead, help to let people fly. What’s next for the CPA? We have some major opportunities for the CPA to show leadership. On Industrial Strategy, the Sector Deal is a very good document that clearly positions products at its heart. The government is saying, here’s your opportunity, so now we need to step up and take it. It is early days, but the Challenge Fund has £170 million to be invested in construction, this is a massive opportunity. Construction has never had that offer before, so how do we seize that? CPA is also continuing to work with government and industry to address the challenges in the Dame Judith Hackitt Review, so that the built environment performs for people, who can enjoy it and feel safe in it.